As part of the deal, Luxottica will design, develop and distribute glasses based on Google’s wearable device. 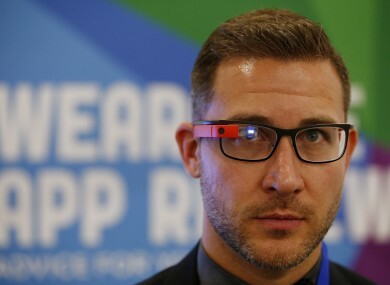 An exhibitor demonstrates Google Glass at the Wearable Technology Show held at Kensington Olympia, London. GOOGLE HAS STRUCK a deal with which could help its wearable device Glass become a mainstream product. The deal with Luxottica, the maker of Ray-Ban sunglasses, will see it design, develop and sell glasses based on Google’s device. Google had already started designing its own prescription frames for the device, but having a major brand behind it will help it when it’s released to the general public. The glasses company said its two major brands, Ray-Ban sunglasses and Oakley, will be a part of the collaboration with Glass, but details about the new products won’t be revealed until later on. Luxottica’s CEO Andra Guerra, said the deal ties in with its work with wearable technology ties in with what Google hopes to achieve. We believe that a strategic partnership with a leading player like Google is the ideal platform for developing a new way forward in our industry and answering the evolving needs of consumers on a global scale. We believe it is high time to combine the unique expertise, deep knowledge and quality of our Group with the cutting edge technology expertise of Google and give birth to a new generation of revolutionary devices. Google has yet to say when it will release Glass, although it’s rumoured that it will release it at the end of this year. The device has been met with skepticism with issues of privacy and security regularly brought up. Email “Google strikes deal with Ray-Ban to make Glass stylish”. Feedback on “Google strikes deal with Ray-Ban to make Glass stylish”.